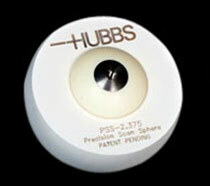 Hubbs Machine & Manufacturing, Inc.® was started in 1984 to manufacture and distribute targeting and accessories for support of Computer-Aided Theodolite Systems. We now support several coordinate measuring systems: Retro-Reflective(R®) and Contrast Photogrammetry Targets, Laser Tracker, and other emerging coordinate measurement systems. Limited support for Theodolite Systems continues. Hubbs Machine & Manufacturing, Inc.® is the original and most trusted manufacturer of quality targeting, accessories, and tooling components. Our designs and part numbers are recognized as the industry standard. The products shown in our catalog are examples of many variations which are possible in Standard Retro-Reflective(R®) and Contrast Photogrammetry Targets, Laser Tracker Adaptors and Accessories in addition to the original Theodolite technology. Many items are available in stainless steel as well as 1144 steel. Our product manifest consists of more than 3300 part numbers, by far the largest in the industry. Even with this diversity of products, we recognize and support the customer's needs for specialized targets and accessories. Our customers have the ability to speak with a member of our team that is directly involved with the production of your order. This unique and direct approach provides for a smooth and correct transfer of requirements that reduce the risk of misinformation, raises consumer confidence, and makes your critical deadline possible. The new "Precision Scan Sphere" is the latest in the Hubbs Machine targeting arsenal. 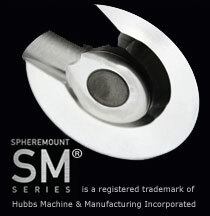 This new target allows for the same offset and centerline values as other commonly used partial spherical targets in the industry when located within their respective conventional Hubbs "SM®" Series, Sphere Mount Target Holders. Hubbs Machine & Manufacturing, Inc. ® has made our catalog sections available to print and download right here on our website. 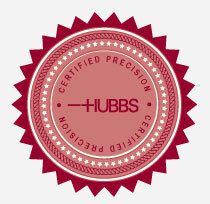 Hubbs has been certifying, serializing, & satisfying for years. For the convenience of our customers, Hubbs Machine & Manufacturing Inc. ® has become ISO 9001:2015 certified. NIST traceable since 1990.